It all depends in what region of the US (or world!) you were raised. Sub is a pretty widespread term, but I think it's the word I use because Subway was only the second chain restaurant to come to the small town where I grew up. (Hardee's was first. )(In hindsight, boy, we were so spoiled.) There's been copious research done about dialect, and I find it all very interesting. Regardless of what you call such a sandwich, the possibility of fillings is endless and exciting. You can't really go wrong, unless you pile on so much stuff that the bread collapses in on itself (and even then, heck, just grab a fork!). This sandwich is adorned with juicy, beefy meatballs, left over from my spaghetti and meatballs experiment. All it needs is a little cheese and perhaps some extra marinara, and boom--that's a wrap sub. What's your word for such a sandwich? What do you love to stuff inside? That looks perfect! The only sandwich on a long roll I grew up with was a hotdog - it wasn't really until subway opened that I thought of them with other fillings. So I'd usually call it a sub. We always called them grinders or subs. Then we moved here, and suddenly they became "hoagies". I grew tired of telling everyone that a hoagie is actually the child who leads the mule towing the barge along the canal, and not his lunch. People (especially my kids) often look at me as if I have two heads. Meatball grinders are probably my favorite, with plenty of cheese, of course. I simply call it sandwich..this looks scrumptious, Grace. Here, a hoagie is a long roll or wrap served in kebab shops (not as nice as sounds) with chips, cheese, dinner meat and all sorts of other rubbish. Your version looks delicious! I grew up calling this sub or torpedo. I'm not sure what I'd call it, probably a sub but I do like torpedo too! I use all three along with sandwich. 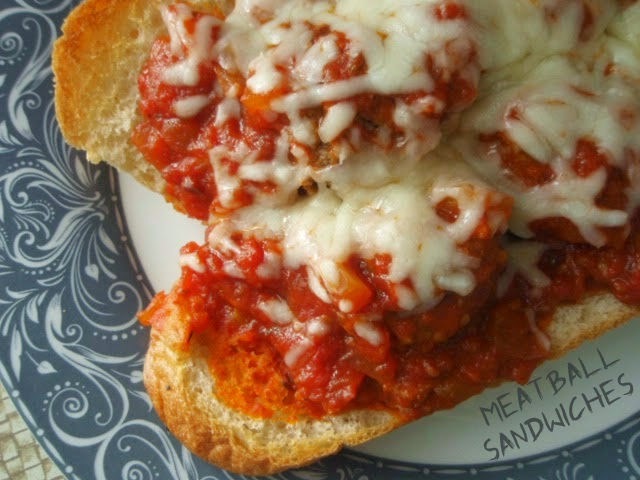 I am thinking your meatball sub looks drool worthy! I say "sub." I think meatball sub rolls off the tongue more easily than meatball hoagie. Love that melted cheese! i say sub! And this is what i call a loaded one. In the best way, obvi. I call them subs, but I think that local restaurants call them hoagies. Either way, they are delicious and you have me craving one! They're subs to me, it's what I grew up calling them. Living in different areas has been really interesting when it comes to regional names for things. I could have written that part about Hardee's. We had a Hardee's in our "blink and you miss it" town before we even got a second traffic light, I remember how excited we were! Next came DQ (hellloooo Blizzard) and a Subway. The good ole' days. lol Your sub looks fantastic and has set off an immediate craving for one. I'd call it a sub, too. And there are a lot of fillings I'd love in it, but I'd probably opt for roasted veggies with goat cheese and arugula! This looks delicious. We like sandwiches of Italian sausages covered in pizza sauce. Yup, now I'm officially hungry! This melted cheese on top just hit a sensitive spot! They're called subs here also and yours looks delicious. Italian Beef with lots of peppers is popular here. Love all that cheese on yours! Mmm this looks so good! I know here in Missouri we just call it s sub. I would call it Delicious!